1 What are the "prairies"? They are mostly open land as far as the eye can see. Sometimes it is flat. Sometimes it is rolling hills. It is where many people came. They looked for a new life. 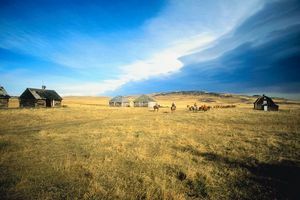 2 At first, only natives lived on the prairie. Some French people moved there to hunt and trade. 3 The English came later. The first English made cattle ranches. Then more people came. They wanted to make farms. They wanted to grow food. 4 Making new farms was hard work. Most people had horses and oxen to help them plow. The prairie grass had thick roots. It was hard to cut through. 5 The people built homes near trees first. They wanted the wood for building. They needed it for cooking, too. 6 When later people came, they lived where there were no trees. They built their homes with the sod. They used the sod like wide bricks. The house was cool in summer. It was warm in winter. Even the roof was made of sod. 7 The prairie ground was good for farming. When there was rain, the wheat grew tall. When there was not enough rain, people went hungry. 8 Some years there was drought. Other years, frost or grasshoppers hurt the harvest. The life of a prairie farmer was hard. 9 In those days wheat was almost as tall as a man. Winds could suddenly flatten patches or whole fields. Machines could not be used to harvest it then.